Oftentimes in the scene of music we cover here and in the macro Americana scene, the songwriter portion of singer/songwriter can often overshadow the former. Chalk that up to the influence of Dylan, Clark, Waits and Van Zandt. When an artist is able to combine a strong songwriting prowess with powerful vocals, then you’re on to something. Paul Cauthen definitely has the pipes to match his pen, and then some. Cauthen cut his teeth in the Texas scene as part of the San Marcos based duo Beck and Cauthen. **Disclaimer–for which I wrote a stirring biography that they eventually had to shelve alongside the name due to legal action from the loser team of Beck Hansen. Paul and David Beck then transitioned to the name Sons of Fathers; and pushed their music to a more eclectic/folk-rock sound. After that band came to an end, Cauthen hit rock bottom and began searching for his next artistic pursuit. He looked deep within himself and began woodshedding; eventually writing upward of 50 songs and being offered a deal on Jack White’s boutique label. He turned it down because he wasn’t done searching. 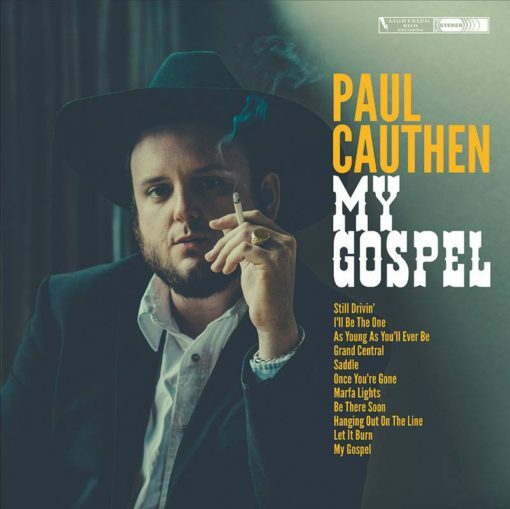 Cauthen eventually found solace in his own gospel. A wide-ranging adventure soon took place that found him at the studio doorstep of producer Beau Bedford. The long introspection was turning into a fruitful vision and sound. That sound would go on to be tracked in three different studios across the vast expanse of California, Texas and famed Muscle Shoals, AL. Bedford and Cauthen have woven together a masterpiece. It’s epic in the traditional sense; not the overused bro sense. Sweeping, eclectic, emotional, unhinged and free. The production has a Muscle Shoals thickness across all tracks and what stands out the most on each song is Cauthen’s vocals. Echoes of Waylon, Elvis, Bono, Springsteen, Marty Robbins, Chris Isaak and even Neil Diamond find their way to full throttled wails and emotive nuance throughout the album. Those are some heavy, heavy comparisons…but they are more than appropriate. Bedford keeps those booming vocals out front in the mix in a powerful, commanding manner. “I’ll Be the One” most closely evokes the mysticism of Robbins and Isaak as Cauthen pleads with a girl who doesn’t want him to give him a chance. “As Young As You’ll Ever Be” showcases some of the most shifty chord changes since Radiohead’s “Kid A”…and on a country song no less. The Springsteen influence shows up on “Once You’re Gone”. “Saddle” and “Marfa Lights” are just plain weird and odd in the best ways possible. “Still Drivin'” is the self-assuring call to arms that is home to the only chorus to ever leave you humming about timpani drums. The Austin Gilliam co-write “Hanging Out on the Line” possesses the type of chorus that stays with you once the speaker is turned off. Each track contains that ever present Waylon howl crossed with the Elvis snarl. Yet, despite all these evident influences, the coolest thing about this record is that this is the sound of an artist sounding like himself. Cauthen searched deep within his soul for these songs and this sound and has discovered something heavenly within his own gospel. A unique, charming, distinct and diverse gospel. That self discovery has led Cauthen to create the record of 2016. Hi there, I found your blog by means of Google whilst looking for a related matter, your website got here up, it seems to be great. I have bookmarked it in my google bookmarks. I just want to say I’m new to blogs and actually loved this web site. Probably I’m likely to bookmark your website . You certainly have superb articles and reviews. With thanks for sharing your blog site. I wish to express my appreciation for your generosity giving support to visitors who really want help with your question. Your special dedication to passing the solution along had become extraordinarily interesting and has in every case enabled guys and women much like me to realize their aims. Your amazing warm and helpful guideline means so much to me and a whole lot more to my peers. Warm regards; from each one of us. Thanks a lot for sharing this with all folks you really know what you are talking about! Bookmarked. Please also talk over with my site =). We may have a hyperlink change agreement between us! Thank you for any other great post. Where else may just anyone get that kind of info in such a perfect approach of writing? I have a presentation subsequent week, and I’m at the search for such information. Magnificent goods from you, man. I have understand your stuff previous to and you are just too great. I actually like what you have acquired here, really like what you are saying and the way in which you say it. You make it enjoyable and you still care for to keep it sensible. I can’t wait to read far more from you. This is really a great web site. I simply wished to appreciate you once more. I do not know what I might have tried in the absence of those ways revealed by you over this area. It was a real scary concern for me, but noticing the very specialized strategy you handled it forced me to leap over contentment. I’m just happy for the service and in addition hope you know what a powerful job you are always accomplishing teaching some other people thru your website. I know that you’ve never got to know any of us.